Perhaps it’s the constant butting up against barriers in daily life that makes Indigenous artists so good at traversing creative boundaries. 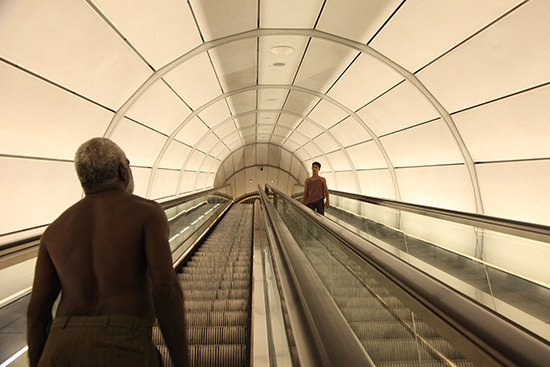 Leading filmmakers such as Ivan Sen and Warwick Thornton, for example, effortlessly move between drama, documentary and video art. Bangarra Dance Theatre director Stephen Page continues this form-crossing tradition with Spear, moving for the first time from stage to screen with his directorial feature debut. Based on the Bangarra production from 2000 of the same name, Spear opens on a stunning clifftop beside the sea. A group of Indigenous men are dressed in jeans, their naked upper bodies marked with paint. The image stakes out Spear’s key concern: the difficult negotiation of tradition and the demands of modern life. The images in the opening moments feel tactile, with close-ups of sand, skin and hair alternating with wide-shots of the stunning landscape. From this seaside setting we move to the city, where the play of light in a shadowy world replaces the sun and sweeping natural vistas. Here Spear’s central character—a young Aboriginal man played by Page’s son, Hunter Page-Lochard —encounters crowds, tunnels, substance abuse and confronting street life in a city haunted by an Indigenous presence. Aaron Pedersen turns in a disturbing performance as a raving drunk, eaten up by anger, pain and mental ill health. Page-Lochard as the young man is trailed through the streets and tunnels by a line of red sand, carving a bloodline, a trace, a wound, across the city’s concrete skin. Cinematographer Bonnie Elliott captures a string of recognisable Sydney locations in stunning high-definition digital images, from outdoor stone staircases in the Rocks to the grim public housing towers of Redfern. Elliott launched her career in 2009 with one of the strongest Australian features of the past decade, Granaz Moussavi’s My Tehran for Sale, and since then has turned her talents to a consistently diverse body of work, including the post-apocalyptic These Final Hours (2013), the TV drama The Slap (2011) and Lesley Branagan’s documentary A Life Exposed (2013). In Spear she draws mainly on a dark palette characterised by gradations of black, brown and silver grey. While Elliot’s work is admirably cinematic, less well-realised is the translation of Spear’s dance-like drama for the screen. The film is surprisingly static, the images pregnant with a slow-building action that never quite comes to fruition. Bodies are too often arranged in immobile tableaux rather than fluid combinations of movement. Their restraint is matched by the camera, with rhythm conveyed more often by rapid-fire cuts than the motion of the lens. Indigenous screen work has offered an ongoing reflexive commentary on its intervention into a century of astoundingly racist images in Australian cinema and art. Sally Riley’s Confessions of a Headhunter (2000), for example, irreverently decapitated statues symbolic of British colonisation scattered across the land. Warwick Thornton rewrote the cinema legend of Jedda in Rosalie’s Journey (2003). Ivan Sen subtle reflected on divergent black and white views of the same landscape in Beneath Clouds (2002). Spear’s “Boomerang” sequence adds another chapter to this ongoing reappropriation of the objectifying and dehumanising power of words, images and songs. Yet despite these flashes of brilliance, Spear never quite coalesces into a convincing whole. The episodic story, such as it is, alternates between the city and the bush, an aphoristic set of encounters with different people and situations. The final scene plays out on Sydney Heads, the city skyline forming a backdrop to striking surrounds that mirror the film’s opening setting. Reunited with his fellow dancers, the young man appears to achieve a reconciliation of sorts, acknowledging his roots and the demands of modern life, enacted in a borderland between city and bush. Given the fragmented experience of the previous 80 minutes, however, the resolution fails to convince, and the dawn setting skirts the realm of cliché. Page has described Spear in terms of a question rather than a statement, “What is men’s business in this contemporary Indigenous world that we live in?” The film is perhaps best understood in these terms: a probing experiment, a first step into a new realm by one of our leading dance makers. 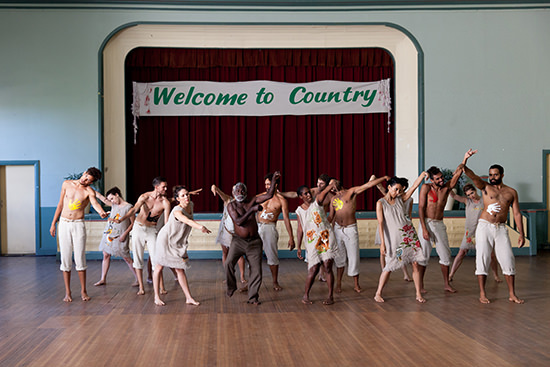 Experiments are becoming increasingly rare in our constricted screen environment, so let’s hope this is a beginning, and not an intriguing one-off for Australian Indigenous dance on screen.